For many years airlines have relied on In-Flight Entertainment (IFE) to distract passengers during long hauls. 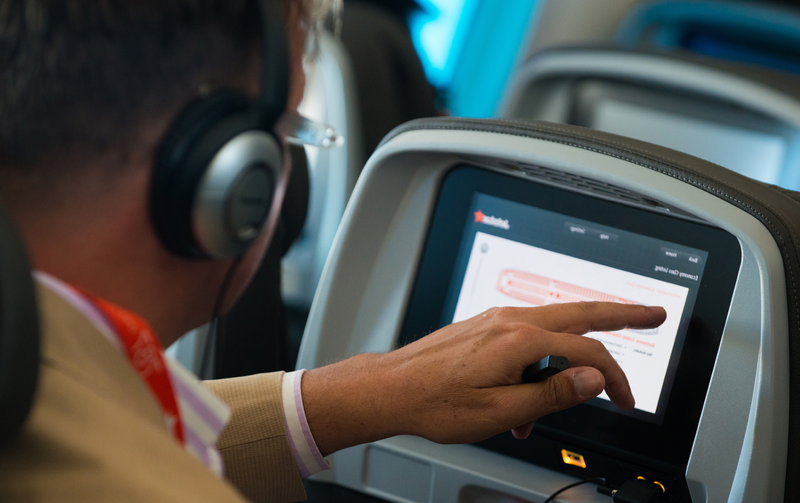 Today, many of them are trying to implement In-Flight Connectivity (IFC) solutions. There are some lessons to learn from the motorcoach Internet WiFi onboard experience. A satellite telco operator recently stated that “airline demand for Wi-Fi Internet is now a necessity” (not a luxury) and that “inflight broadband is “revolutionizing” passengers’ expectations of the onboard experience”. According to them, the “inflight Wi-Fi is more important than onboard entertainment” and “a large portion of passengers would pay for inflight Wi-Fi rather than use free onboard entertainment”. While disagreeing with some of their views, we concur with one of their further statements: “overwhelmingly, passengers would expect the same levels of connectivity and access to online services whilst they are at 30,000 feet as they receive on the ground”. If the idea is for the satellite Wi-Fi Internet to replace the in-flight media entertainment, a short calculation may illustrate the challenge the airlines will face to fulfill the passengers’ expectations. What can you possibly do with 15 MB of data for 5 dollars? Well, you can watch a 2 min clip, or send a few e-mails with small-size attachments, or post one or two photos in your Facebook or Instagram … that’s about it. For 20 dollars you might think you’re now “truly connected” and not need to worry for the full flight … until you reach your 100 MB limit!! And how long will it take to do that? Well, most smartphones nowadays can have a Wi-Fi throughput of 2 to 5 Mbps or roughly 0.25 to 0.6 MB per second, that’s about 25 to 60 MB per min … we let you do the rest of the math. For many years, the motorcoach industry has been trying to provide Internet WiFi connectivity onboard as a value-added service to their passengers. However, despite the fact that this service is free of charge, the user experience has not been to the level of the passengers’ expectations. This is mainly due to the fact that passengers associate the WiFi offering to the same Wi-Fi speed they could have at home or office. It is not uncommon to read tweets and posts of upset passengers complaining about the poor Wi-Fi service offered by bus operators. The on-board Wi-Fi system on most intercity buses is based on cellular connections where Web browsing is not particularly fast and video streaming is very hard to accomplish with poor signals outside urban areas. Most motorcoach operators block access to sites and services requiring high-demanding Internet streaming bandwidth. The result is a service that is rarely appreciated by travellers. At ONGOING, we believe the future of the onboard passenger experience will rely on the best mix of entertainment and connectivity. But that’s not all, companies who would like to go even further will start “engaging” with their passengers with a truly personalized experience, providing passengers with the content they would appreciate and the connectivity services pertinent to them. ONGOING is busy working on delivering these capabilities and more to its customers … stay tuned.